We are days away from Christmas and I know I should be posting about baking tasty cookies that ooze homemade jam or the best way to decorate your jars for gift giving or even providing you all with wonderful tips for enhancing your Christmas dinner but like most people at this time of year I’ve been swept away by it all. So, instead I will proceed on the course I set out to complete many months ago. The post should have appeared in October when tomatillos are harvested and available here in Northern Ontario. However, I know for a fact lots of southern US states will be seeing these guys make their way to farmers markets very soon! They are part of the tomato family and should ripen along side their red cousins. 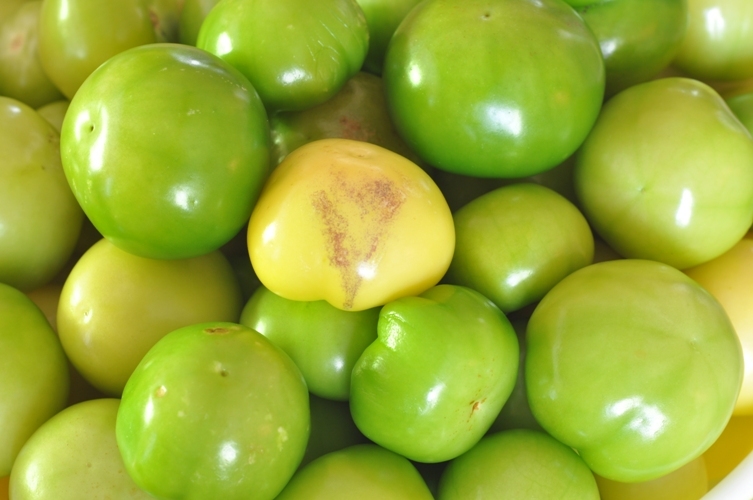 Tomatillos are those delicious tomato like fruit used in an assortment of mexican dishes. I fell in love with them after just one bite. Now, some will probably think I’m crazy but I actually enjoy eating them out of hand. They are tart yet sweet, with a firm texture and very small seeds. Perhaps a cross between an asian pear and a kiwi!?! If you can get them to grow, they will take over because they are a weed so it is a good idea to plant them in a separate area. A weed bearing fruit?…what an excellent idea! I “heart” tomatillos! In the early fall and before the frost hits, I helped a friend harvest these golden green little gems. There were so many it was hard to imagine putting them all up. I took about 30lbs of them, many were gifted to fellow canners, some added to sandwiches, and those left behind were turned into the soil to grow up again next year. 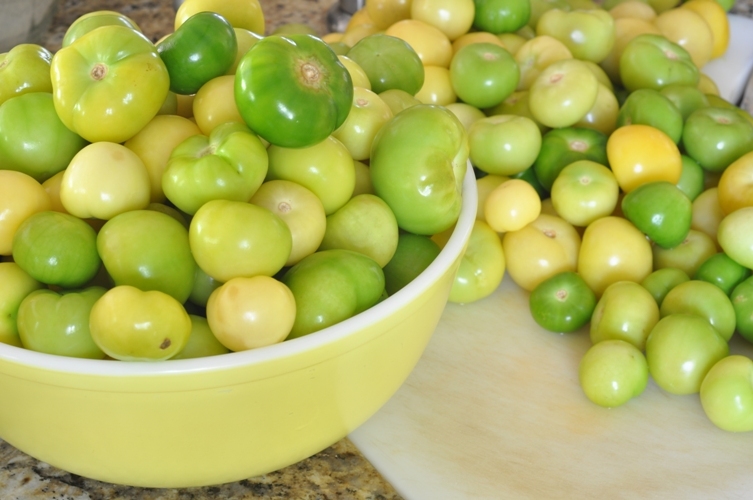 About 16lbs of tomatillos were made into Tomatillo Mexican Salsa (a true must) leaving another 14lbs to contend with. 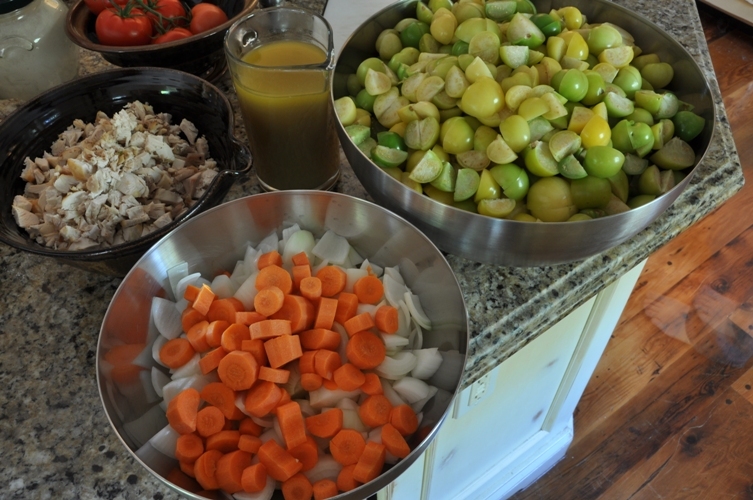 We concluded soup was a quick and easy way to put up the remaining tomatillos. Clearly, we had a glut of tomatillos and this recipe was derived out of the need to put them to good use. You can do it on a much smaller scale using boneless skinless chicken breasts but we decided we were going to need more than just a few chicken breasts to make this soup hearty. So, two whole chickens was the most economical way to proceed. 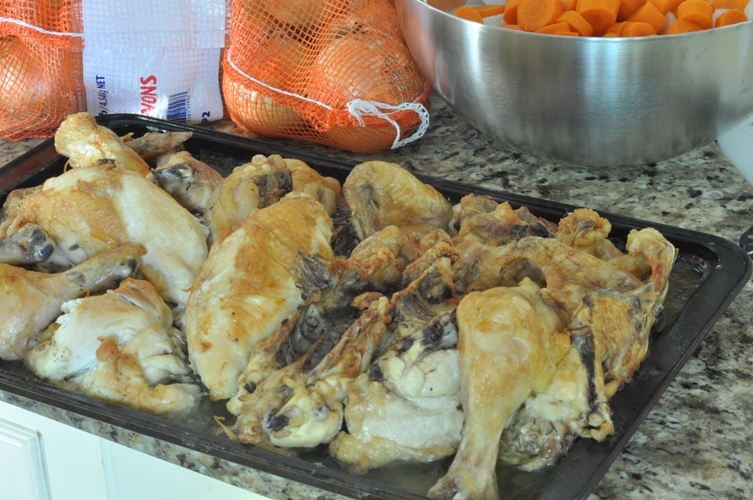 Place the quartered chickens in the oven at 325F to roast for 1h30. Once cooked, remove chickens from oven and allow to cool slightly. Remove skin and all meat, chop into small bite size pieces. Set aside to add to soup later. 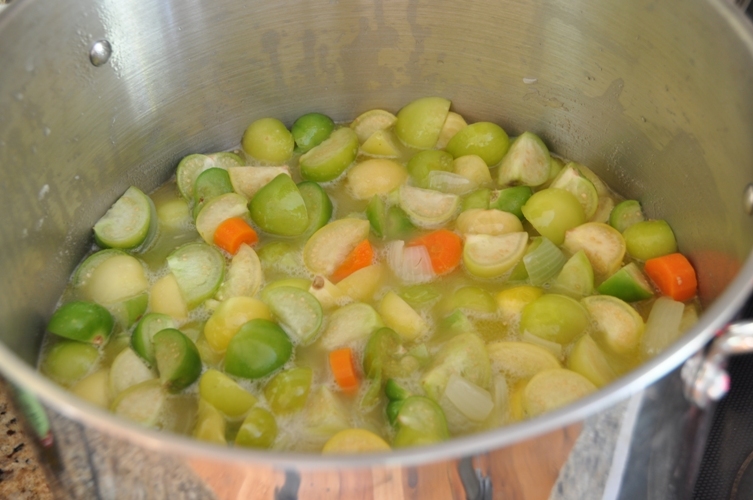 In a large stainless steel saucepan, add 3 tablespoons of the fat from the stock (or 2-3 tablespoons olive oil). Add onions, carrots, and garlic and sauté until golden brown (about 10 minutes). Stir in prepared tomatillos, banana peppers, and chicken stock. Bring to a boil over high heat. Reduce heat and simmer covered pot for 15-20 minutes. Turn off the heat and remove. Using an immersion blender or working in batches in a food processor purée the soup. Tomatillos’ tartness is balanced out with heat so be sure to taste the soup and if it requires more fire add some hot sauce, cayenne pepper or chili flakes. Do it bit by bit. Personally, I can’t handle too much heat so recipes presented here are always adjusted to suit my tastes (a comprise my husband adjusts when food is served by pouring on the Franks). You can always spice it up more when served. Return to medium-high heat and add chicken. Stir to combine. Taste the soup and add salt and pepper if necessary. 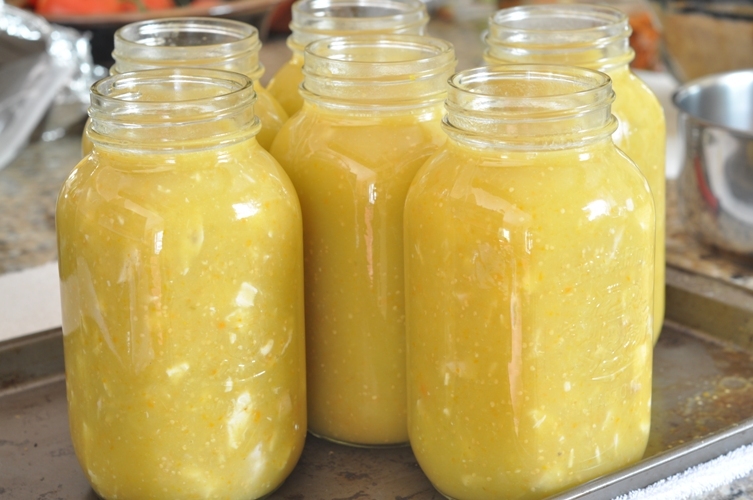 Remove from the heat and ladle into hot sterilized 1 litre (quart) jars leaving 1″ headspace. Remove air bubbles and adjust headspace by topping with hot soup. Use a damp paper towel to wipe the rims of the jars, then put a flat lid and ring on each jar, adjusting the ring so that it’s just finger-tight. Process in a pressure canner following directions carefully. We pressure canned this soup at 10lbs of pressure for 80 minutes. Please follow the instructions and guidelines outlined in your pressure canning manual or found on The National Center For Home Food Preservation. 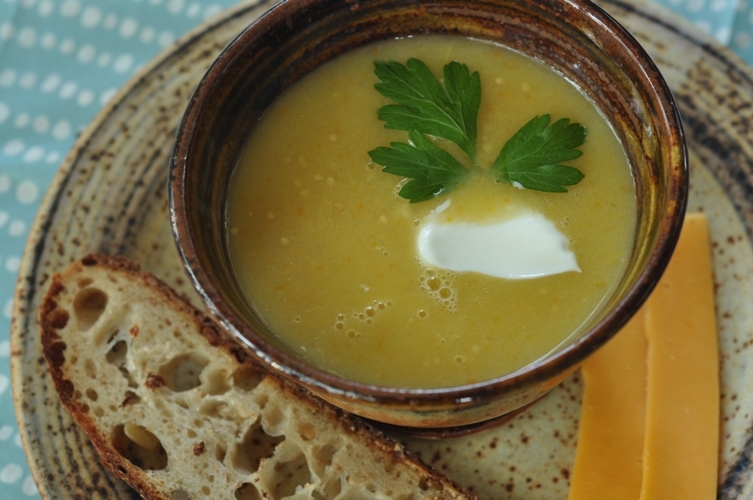 This soup can also be served fresh or jarred and refrigerated to be eaten over the next couple of days. First time I forgot to include our Put up Total (it’s our form of record keeping)…I added it at the bottom. It made 9x1L jars. Thanks so much. BTW, served your carrot and ginger soup New Year’s Eve and it got raves.